The Drummer Agency is a London-based company that plans and launches charity campaigns, offers consultancy in fundraising and strategic planning, and develops solutions for effective fundraising campaigns. It specializes in creative services and marketing, digital development and video production – all aimed at attracting public’s attention to the most urgent causes and making a difference. N-iX Game Development and VR Studio were really excited to partner with The Drummer Agency. We have been working on various projects since March 2016 developing VR solutions that would enhance people’s perception and understanding of the most urgent problems of our time like poverty, water shortage, environment pollution etc. The possibilities of VR technology turned out to be especially applicable in the fundraising sphere as it can take the potential donor anywhere anytime to demonstrate the needs of a certain region or community. N-iX expertise in VR art production, interaction design and VR software development has ensured the timely and successful release of the first project. The team’s professionalism and ability to implement client’s most complex ideas consolidated the partnership so we’ve started cooperation on more VR projects. The Drummer Agency is a UK-based creative marketing agency specialising in (not just) the charity sector. 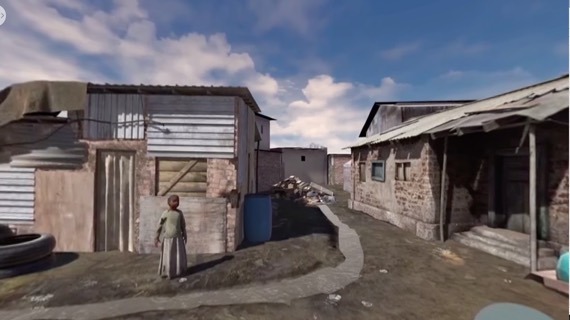 Africa is a demo VR project developed for Samsung Gear VR. It is a virtual reality experience that takes you to one of many African slum areas where you can explore the life of local communities and even interact with the environment. There are 5 interactive points in the demo, so a user can watch a video, improve the environment, check out how people’s donations can change it. The demo features photo-realistic characters, the elements of video VR and realistic interactive assets. N-iX VR department’s expertise in developing for Samsung Gear VR, Oculus Rift, HTC Vive and other headsets has made it possible to meet 2 major client’s demands, namely, make the demo as realistic as possible and deliver it in a very short time. To reach the level of realism the client desired, we used photos of real locations, and people when creating assets and characters. Although buildings and locations are not photographic, we used the photos of real locations to recreate the materials and textures peculiar to that region. We paid special attention to lighting and other effects like flying pieces of dust and sand.